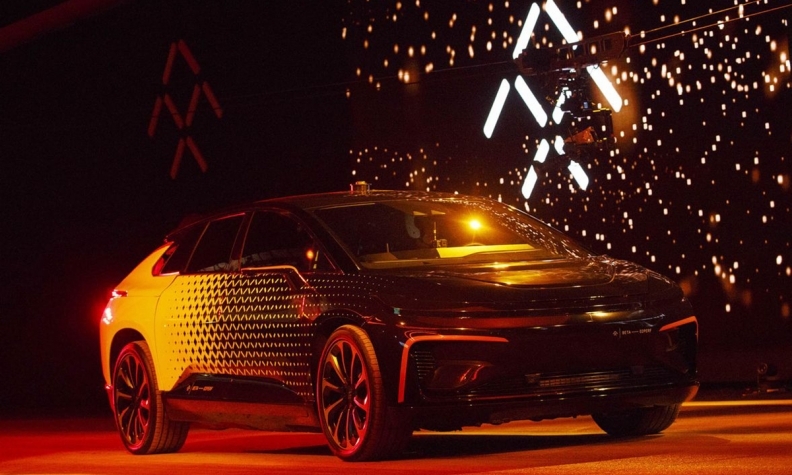 Faraday Future, the electric-vehicle startup backed by LeEco founder Jia Yueting, halted plans to build a $1 billion factory in Nevada as the troubled tycoon fights for the survival of his Chinese car business. The plant in North Las Vegas that was due to build Faraday's 1,050-horsepower FF 91 has been put on hold, according to an emailed statement. Faraday earlier this year claimed the FF 91 would be the world's fastest electric car, beating souped-up versions of Tesla Inc.'s Model S sedan. "We are in the process of identifying a manufacturing facility that presents a faster path to start-of-production and aligns with future strategic options," Faraday said in the statement. The halt marks another setback for one of China's most outspoken and controversial entrepreneurs. Jia made a fortune building Leshi Internet Information & Technology Corp. into China's answer to Netflix, then struggled as he tried to expand into smartphones, movies and autos. Amid a cash crunch, Jia ceded the CEO role at Leshi and last week said he would step down from its board to focus on serving as chairman of LeEco's auto unit and Faraday Future. Jia asked in a Weibo post for LeEco to be given more time to repay its debts after a Chinese court froze billions of dollars in assets that he controlled. "We're moving our FF 91 plant to a new location to ensure on-time delivery of our product," Jia said in a post on WeChat. "We're now doing our utmost to adjust our existing factory and buying equipment, to get to mass production as soon as possible." In a Chinese statement attached to the post, Faraday Future added it would keep all rights to its site in North Las Vegas and still planned to build a vehicle production facility there in the long term. Construction on Faraday's Nevada factory paused at one point late last year when the facility's building contractor claimed payments had stopped. At least two other suppliers, including a car-seat maker and media-services provider, took legal action to force Faraday to pay its debts. While Jia's a backer of Faraday Future, he said LeEco doesn't own any shares in the carmaker. The state's agreement with Faraday required the company to fully invest a minimum of $1 billion to receive incentives, the Nevada Governor's Office of Economic Development said in an emailed statement. "The state recognized both the opportunity a large manufacturing facility could provide as well as the inherent risk associated with a startup company attempting this endeavor," the governor's office said. "The agreement with Faraday held Nevada's citizens harmless from the risk associated with this project." Nevada Treasurer Dan Schwartz questioned Jia's plans for the electric-car plant there last year. He called the billionaire's strategy of borrowing to finance so many new businesses so quickly unsustainable. "This is all Fantasyland," he said at the time. "The best analogy is the Emperor's New Clothes. There's nothing there."